Google provides a large amount of data to businesses that use their tools for search advertising. However, the way they’ve given out data in the past hasn’t always been too clear. This has led to confusion about where ads are being placed or how well a particular ad is performing in search results. To remedy this situation, Google is introducing new ad position metrics to help advertisers understand their ad performance. The old ad metrics Google used were a little unclear (possibly intentionally) and it probably resulted in people thinking their ads were performing better and appear in better positions than the actually were. To illustrate, an ad with an average position of “1” could be appearing only at the bottom of the page. The new metrics will make it easier to see how an ad is performing and where it’s showing up. Impr. (Absolute Top) % – This is the percentage of your ad impressions that are shown as the very first ad above the organic search results. Impr. (Top) % – This is the percentage of your ad impressions that are shown anywhere above the organic search results. Search (Absolute Top) IS – This counts the number of impressions you’ve received in the absolute top location (the very first ad above the organic search results) divided by the estimated number of impressions you were eligible to receive in the top location. Search (Top) IS – This counts the number of impressions you’ve received in the top location (anywhere above the organic search results) compared to the estimated number of impressions you were eligible to receive in the top location. Marketers can use the first two metrics, “Impression (Absolute Top) %” and “Impression (Top) %“, to determine when and where your impressions are showing above the organic search results. 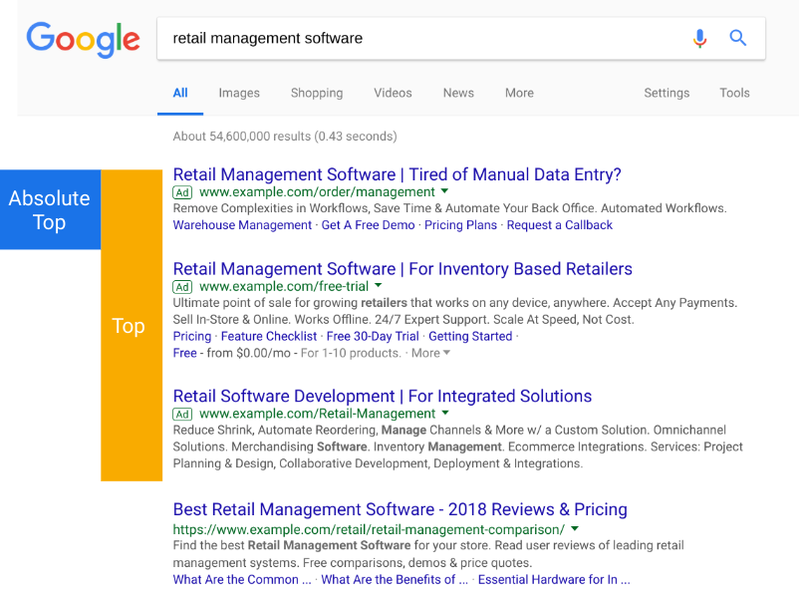 The other two metrics, “Search absolute top impression share” and “Search (Top) IS” can be used to indicate the available opportunity to show your ads in more prominent positions. Marketers who are trying to bid for page location should use these metrics. In the future, Google plans to incorporate these metrics into automated bidding options in Google Ads. So be ready to see some new metrics when you run reports on your Google PPC ads. Remember that your ads are performing the way they always have, the new reports are just better reflecting where they were and how well they did. Check out this article for more practical marketing advice small business owners can use.